As cooler weather approaches, why not consider taking the usual princess party up a few notches with a Frozen theme? Pinterest abounds with amazing ideas—from creating sparkle-sugar dipped cake pops with dollar store plastic icicles as sticks to spectacular multi-tiered birthday cakes featuring rock candy sticks as the towering spires of Elsa’s wintry palace. Water bottles with specially printed labels saying “Melted Snow” (or “Melted Olaf,” if you’re less sensitive) are a wonderful way to keep the kids hydrated, and home-made blue “ice” candy and cold-to-the-touch, Borax-free gel/slime provide unusual and fun activities for children of any age. For more “expected” activities, there’s Pin-the-tail on Sven (the trusty reindeer sidekick), or making magical wands using straws, ribbon, and dollar store snowflakes. Goody bags can contain everything from rock candy to glitter gel pens—if it’s blue, white, or purple you can’t go wrong! A deluxe party can be had for much less than you might think. A long-roll painter’s tarp in white can make any floor a snowy walkway, and hand-cut snowflakes can be strung from anything that will hold them. Twinkle lights can add ambience, too. If you can put crystal glitter on it, do it, to cement the snowy theme. Every little girl wants to be a princess. We’ve made it easier than ever to give every guest her own Elsa moment with our selection of Frozen tutu and headband sets. 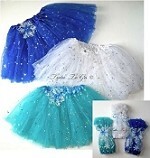 They come in two shades of blue, and of course, icy white, and all are covered in sparkle!